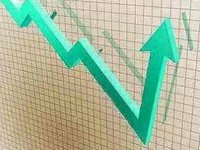 Ukraine's GDP in January-March 2018 grew by 3.1% year-over-year, the State Statistics Service of Ukraine reported on Tuesday. The country's economy grew by 0.9% compared with the previous quarter. As reported, the World Bank left unchanged the forecast for the growth of Ukraine's GPD in 2018-2019 at the level of 3.5% and 4% respectively. At the same time, the World Bank warned that the forecast for 2018 envisages the implementation of deferred reforms by the country. If they are not implemented, economic growth may slow down to almost 2%. The IMF retained the forecast for GDP growth in Ukraine in 2018 at 3.2%, while at the same time worsened it for 2019 to 3.3% from 4%. The NBU predicts the acceleration of GDP growth in 2018 to 3.4% from 2.5% in 2017, a slowdown in 2019-2020 up to 2.9%. The European Bank for Reconstruction and Development left unchanged the forecast for the growth of the Ukrainian economy in 2018 at the level of 3% and expects the corresponding growth rate would be maintained in 2019.